In the 1930s New Zealand teenager Shona Dunlop studied with expressionist dancer and choreographer Gertrud Bodenwieser in Vienna, then joined the Bodenwieser Ballet. Forced to leave Europe in 1938 (many of the dancers were Jewish), the company based itself in Australia, touring New Zealand in the late 1940s and early 1950s. After marrying and living in China and Africa, where she worked as a missionary, Dunlop MacTavish returned to New Zealand on the death of her husband, Donald MacTavish. In 1958 she opened a dance studio and in 1963 she set up a performing group, Dunedin Dance Theatre. 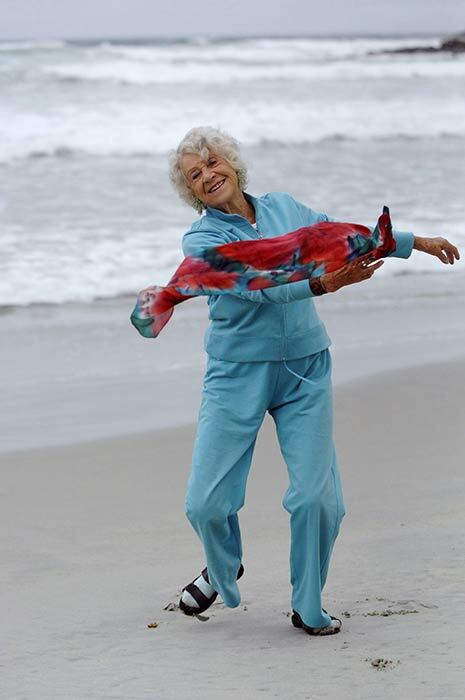 She continued to be actively involved in dance into her 80s. Dunlop MacTavish is seen here at St Clair beach in Dunedin in 2009.